Over the past 12 years Pip Utton has become internationally recognised as one of the leading performers and writers of solo drama. He has performed in over 20 countries receiving rave reviews and winning many awards for both the writing and the performances, recently winning the UNESCO award for Best Solo Performer. 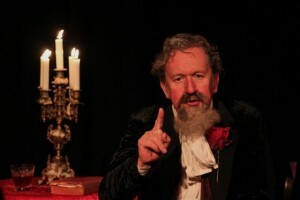 Following a highly successful run at Edinburgh in 2011, Pip returns to the Artsreach circuit with another electrifying character makeover, as Charles Dickens, celebrating the great writer’s bicentenary this February. Charles Dickens, the greatest English novelist, walks on to the stage, clutches his chest, staggers, slips from his sister-in-law's arms and falls down dead. Seconds later he leaps up, entertaining the audience by describing his final moments and relating what he believes were the happiest years of his life. Pip is mesmerising as Dickens, unveiling to the audience that the writer wasn't the grave, serious man of myth but a man full of energy, passion and fire, a man who was a catalyst in the social revolution that began during his lifetime. For ages 14+. Show starts 7.30pm.